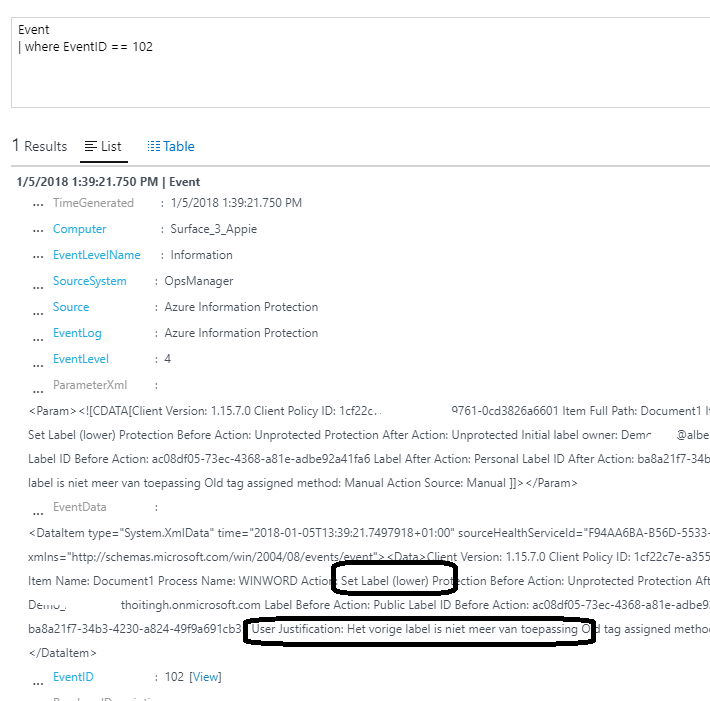 In my previous blog I showed the current locations used by AzureIP for storing log files and event logs. I ended that article with the remark that a more central location would be preferable. And I think this will coming soon. But in the meantime, let’s look at another Azure option: Azure Log Analytics. I was wondering if this function could be used to monitor the events related to Azure Information Protection. It can, and more. At the end of this article, I will show you that downgrading the classification of an AzureIP labelled document will trigger an event that is picked up by Azure Log Analytics. But first: how to? In order to use Azure Log Analytics, you will need to go to the Azure portal. Here you either search for “log analytics” or go to More services | Intelligence + Analytics | Log Analytics. 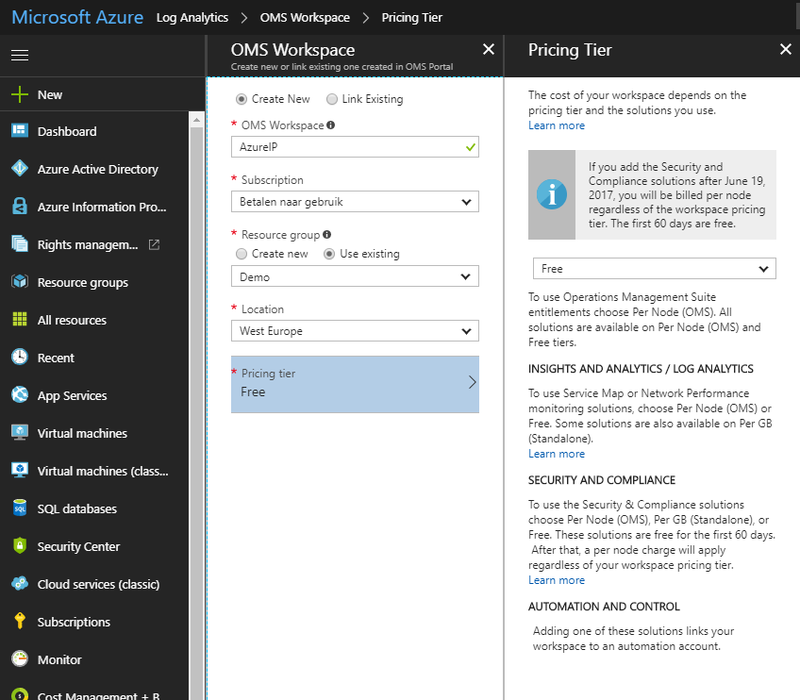 From here you will set-up a new OMS Workspace. After a little time, you will see the confirmation that the OMS environment has been deployed. Now you can start configuring which environments and what data you would like to analyse. This is also the location for the ID’s and key’s needed when installing this client. The client will take care of any configuration, so you don’t have to configure anything yet. Let’s look at the data part. As I want to monitor certain events, I add a Windows Event Logs data source. This basically ends the configuration for now. Let’s look at the client. I installed the client from the download page as seen above. You will need to configure the client to connect to OMS and have the workplace ID and keys ready! Please note the connectivity. The client requires a connection to OMS and can be configured to handle proxies. See the documentation for this. After configuration, you’ll notice little. This is to be expected, as you’ve just installed a Windows Service. You can find the client here: C:\Program Files\Microsoft Monitoring Agent\Agent (for the 64 bit client, that is). You can start the client to check if everything is up-and-running. Please allow the client so time to send the information to Azure Log Analytics and save some time as-well for Log Analytics to process the information. In the end, you can start looking at events. You go to Log Analytics | Log search and here you’ll find a query based interface. The results can be exported or used in PowerBI. As a test, I downgraded a Word document. And this event was found by Azure Log Analytics. 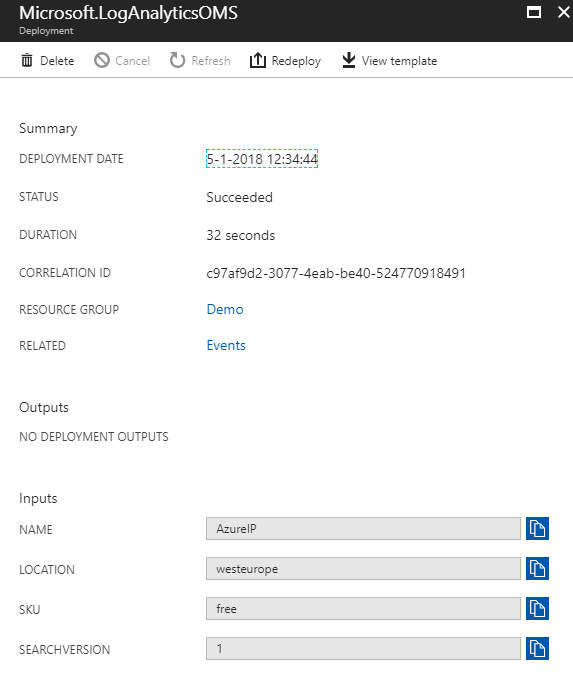 In this article I wanted to show you that you can aggregate AzureIP event log entries to a central level. I have not tested this in an enterprise wide environment or looked at ways to automate this process. But I do hope this gives some information. In order to collect “azure Information Protection” event logs from client into Log Analytics, do we need additional solutions on Log Analytics? I do a test on a Azure console, create a new workspace with only Log search solution (without security or others solution). I try to add the name of the event log in advanced setting, but I cannot find Azure Information Protection. Sorry about this. You can just add “Azure Information Protection” as the name for the event.